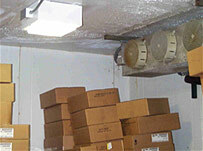 We have successfully used thermographic testing to monitor cold stores. 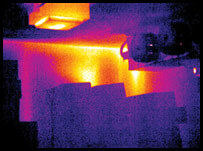 Using infrared it is easy to see where a heated door seal is failing, or where a leak has occurred within the cold store itself. Where there are such extremes of temperature in this environment, the anomalies show up extremely well and can guide engineers to the exact point of the problem. Incontinuity in insulation also proves a problem in cold stores, meaning more energy is used to keep a constant temperature.